Panagbenga | Baguio Flower Festival | Go Baguo! Panagbenga, which translates to "a season of blooming" is the most visited celebration of Baguio City, Philippines. 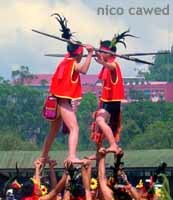 The Panagbenga is held yearly during the month of February. The celebrations are held for over a month sometimes while its peak periods are the parade weekends. Panagbenga is a Kankana-ey term for "a season of blooming." Since 1995 it has paid homage to the beautiful flowers the city is famous for as well as a celebration of its re-establishment as a premier Philippines tourist destination after the devastating 1990 earthquake that hit the Summer Capital. 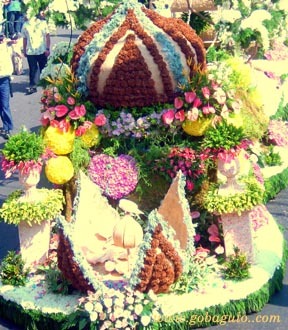 The Panagbenga will have spectators enjoying a multiple floral and float parades. Street dancing and band competitions are participated in by local residents and institutions that put on a great show yearly, after months and months spent at rehearsals, costuming and choreography. Come join us next February -- you'll love the Panagbenga! More than a decade later, festival has grown bigger and more extravagant. The Parade of Floats and other events now welcome participants from other regions in the Philippines, while the Street Dancing has evolved into grander productions by the different Baguio schools. Regular visitors know better than to attempt bringing a car to the parades and that a lot of walking is done in a convivial and pleasant manner. The weather has been perfect on most years, although the City of Pines has experienced light rains on only two the festival's many runs since 1995. The Panagbenga's phenomenal rise to the top of the Philippines' Fiesta Calendar since 1995 is a testament to creativity and industry of Baguio residents show-casing the wonderful community spirit complementing the city's lovely natural environment and rich cultural heritage, that makes the Panagbenga draw tens of thousands of visitors every February..